La Trobe University has a proud history of undertaking research to address pressing societal needs, never shying away from progressive and at times controversial topics. We foster an aspirational and ambitious research and innovation culture. Our researchers are astute, ethical and engaged with their communities. Our strong drive, combined with our breadth of expertise, means that La Trobe University researchers are sought after for the understanding and impact that they bring to pressing questions. 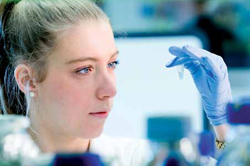 Research at La Trobe University is undertaken by more than 2500 academics and graduate researchers in our Departments, Schools, and Colleges, at six campuses across Victoria. Much of our research takes place in Research Centres or is aligned with one of our five Research Focus Areas. Our research endeavours are supported by our world class research infrastructure, our library, our internal funding sources and, of course, the funding we receive from our partners and grant agencies. Support is provided by the Graduate Research School, Research Education and Development Team, Research Office, Library, ICT and Offices of Research Development and Industry Engagement, to create a thriving environment for researchers at all career stages. In 2017, over 3000 research outputs were generated, spanning traditional publications, such as journals, books and research reports, to non-traditional forms, like creative and journalistic works. La Trobe University researchers undertake work across a broad range of disciplines and are esteemed in their fields, winning prestigious awards and being elected to Learned Academies. We generated over $100 million in research income in 2017—more than 60% from engagement activities. La Trobe University’s research activities put us amongst the world’s best: ranked 301 in the Academic Ranking of World Universities; and 30 fields of research were rated at above, or well-above world standard by the 2015 Excellence in Research Australia assessment. The 48-hectare Research and Innovation Precinct and the organisations located there will form an integral part of our future expansion and provide ongoing opportunities for partnership and collaboration. Our research mission is to increase human knowledge and strive for a better society through engaged, impactful, outstanding research. Our research vision is to conduct research that is world class and transforms our communities, partners and collaborators, and that our graduates are sought after for their ability to meet industry needs and adapt to a changing world. To achieve continual and sustainable increases in research income, productivity, impact and recognition including improvement in international and industry collaborations and graduate research completions. In 2022 we will be ranked in the top 250 universities in the ARWU and in the top 300 universities in the QS and THE rankings. Our goal is to become recognised as the ‘Unrivalled Partner of Choice’. Our aim is to double partnership revenue from research and education. To deliver a consistently high quality experience for all graduate researchers regardless of campus location. La Trobe University to be top 12 in Australia and top in Victoria for high quality graduate researcher experience and learning outcomes, as measured by the Postgraduate Research Experience Questionnaire. To continue to improve Graduate Researcher employability outcomes. La Trobe University to be top 12 in Australia and top in Victoria for graduate researchers in full-time employment (as measured by the Graduate Outcomes Survey).